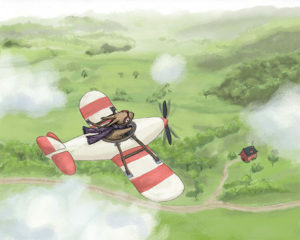 The following is a guest post by Dominika, owner of Hoppy and Clover (seen on the photo pages). 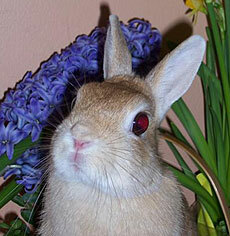 Her story demonstrates the positive effect a pet rabbit can have on a family. 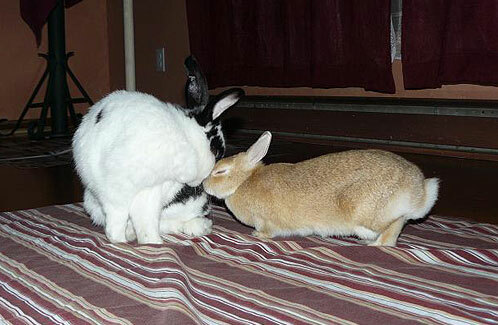 There is nothing like having a bunny friend, in the best of times and in the worst of times. My bun, Hoppy helped me get through a very difficult time in my life. Two years ago my son, who was 13 months old at the time, became very ill. He had to stay at a hospital that was two hours from our home, and I stayed there with him. It was devastating not knowing what would happen with my baby, and my husband and other son could only come on the weekends to see us. After a couple of weeks I was very depressed, and the hospital staff kept on asking what could they do to make me feel better. So I told them I would love to have my bunny stay with us, and to my surprise they allowed her to come over. At first it was going to be only for a few days but once they met her, she was allowed to stay for as long as we wanted and ended up living in our hospital room for over two months. Having her with us was good not just for me but for everyone, all the nurses would stop by to visit with Hoppy, and some would bring other children to see her too. When my son was more sick and had to stay in the ICU, I had nurses and even doctors offer to take care of Hoppy for me and some wanted to take her home. It really was nice to have her with us. One reason why I wanted to tell this story is that I have come across people who feel that they need to find a new home for their bunny because they are having a baby and believe that being around a rabbit would be harmful to the baby. Obviously that is not the case and even though my son takes medications that suppress his immune system, he is perfectly safe being around our (now two) bunnies. My son is now three years old and loves his two bunnies. 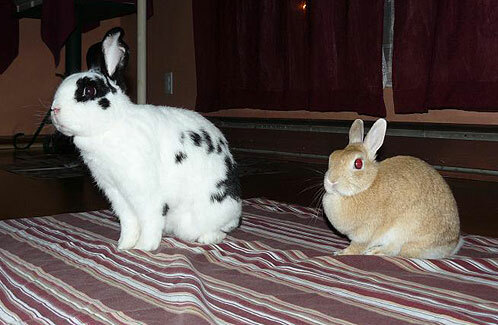 Hoppy is now six years old, and she has a new friend named Clover who is about four years old. Although bunnies are not recommended for children that young, I am very careful to always supervise, and my kids have been taught not to pick the rabbits up and to interact with them on the floor. The activity that both the kids and the bunnies enjoy the most is “treat time”. Indeed we can be pretty amazing!!! Thanks for a nice story.